I have been trying to paint the up the Hanoverian-British division of Walmoden's Korps at the Battle of Gohrde 1813. This is a pretty obscure unit and it is quite difficult to find information about the uniforms and to source figures. I decided to go with some Perry Hanoverians, although I know these are for their 1815 line. The uniforms would have changed significantly over this period of time, but what of it and I can use them maybe for some Waterloo project in the future. I used a number of references as note above. I have the Osprey Men at Arms 206 on the Hanoverian army and that is where I got some of my basic information for 1813, I also had researched the OB for the Battle of Gohrde in an earlier post. I also used some references from the following links as listed above: the Napoleonic Series, Gen de Brigade forum, a nice clickable reference to the Battle of Waterloo OOB, the Mont St Jean site and this pamphlet by WJ Rawkins. 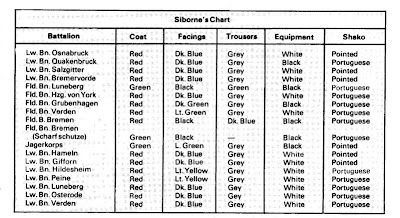 I also used Siborne's well known uniform table as follows, although there is some debate about it's accuracy. I'm very impressed how you've organized your unit and uniform data. My records consists in notes scribbled on index cards which seem to have the nasty habit playing hide and seek. I almost always work on my miniatures with my I-Mac at hand so putting the info down electronically is easy. I will also be spending some time on the Napoleonic Series website - looks like a great resource - thanks for the tip. My wife tells me that I am obsessive!! "My wife tells me I'm obsessive"
Glad you've put it all on a spreadsheet - that's a great reference in itself! Thanks Doc. I will put some uniform and figure links up as well. Wow - you get away with just a label of "obsessive"!